Britain must take 10,000 refugees Yvette Cooper says as she accuses David Cameron of an "immoral" response to the migrant crisis. The Labour leadership candidate blamed ministers of "political cowardice" and described Britain's net migration target which includes refugees as "immoral." Miss Cooper said Britain should be proud of a "British way" and our history of taking in 10,000 children of the Kindertransport in the 1930s and refugees from Bosnia in the nineties. She described Britain's current policy on refugees as "immoral," "cowardly" and "not the British way." It is estimated that 2,500 people attempting to cross the Mediterranean have died this year. The shadow home secretary called on all parties including UKIP to support calls for an urgent national conference to assess how many places British councils can offer to refugees. Speaking at the Centre for European Reform on Tuesday, Miss Cooper said: "If every city took 10 refugee families, if every London borough took 10 families, if every county council took 10 families, then in a month we'd have nearly 10,000 more places for vulnerable refugees fleeing danger, seeking safety." She called on David Cameron to show leadership and for Theresa May to "urgently" work with councils and communities, adding that Britain must be able to look "our grand- children in the eyes" and say "we did not turn our backs." Miss Cooper said she was calling on "Britain to be Britain" because "we cannot allow the politics of fear and blame to paralyse us, and let this humanitarian crisis go on." Ms Cooper can get stuffed. These are not refugees but economic migrants; perhaps the silly (wannabe party leader) woman needs educating as to the difference? COVENTRY should play its part in the UK taking in more refugees urgently as the international crisis unfolds, a leading councillor has said today. Labour cabinet member, councillor Ed Ruane, called on the Conservative government to act urgently amid daily images of suffering at European hotspots among thousands fleeing unstable and war-torn countries. Coun Ruane, cabinet member for children and young people, called for a more humane approach. He said: “I’m proud that under the Vulnerable Persons Relocation Scheme for Syrian nationals, launched in the UK last year, that of the 187 people who have been resettled, about 50 have come to Coventry. “We should do much more as a country. The small number taken by the UK is utterly shameful. “There is still a large amount of local authorities refusing to participate in this scheme and they should be named. “We must extend the hand of friendship. This is not some diplomatic chess match. We are talking about human suffering on a massive scale. So far it looks like we’ve learnt no lessons from history. “There is no question that those Syrians who have come to the UK under the relocation scheme have been through significant trauma”. Although it is co-ordinated by Coventry City Council, the scheme is delivered by the voluntary sector. Coun Ruane added: “We are not helped by the poorly informed public debate which, perhaps intentionally conflates three quite different movements of people; free movement within the EU, irregular or unauthorised migration and the plight of the Middle Eastern refugees. “While our misguided foreign policy and unwillingness to tackle change may give us a moral responsibility for those fleeing famine and conflict, our responsibility towards refugees from war zones is clear under international law. “Due to our commitments to the UN Refugee Convention, the vast majority of Syrian refugees who reach our territory are given asylum but the UK has taken fewer Syrian refugees than many other European countries. We can't afford to look after our own, we can't afford those we've already taken, how on earth can we afford to take more? Where's the money coming from Ruane? Where's the homes coming from? How about the schools and the rest of the infrastructure? Britain should prepare to open its doors to almost quarter of a million people, the leader of the Green party has claimed. As the government draws up plans to accept for fewer than 10,000 extra refugees, Natalie Bennett said the UK has a 'humanitarian responsibility' to welcome 240,000 people. It would mean taking one in eight of 2million refugees, equivalent to the entire population of the city of Wolverhampton. Miss Bennett admitted that the number 'sounds daunting' but claimed Britain could not be a 'foot-dragger' on the world stage. David Cameron today promised Britain would welcome 'thousands more' Syrians currently living in UN refugee camps. The Prime Minister vowed that 'Britain will act with our head and our heart' as he announced plans to dramatically expand a scheme to resettle over 10 times more refugees in the UK. But Miss Bennett said the offer did not go far enough, and claimed Britain should be willing to take 240,000. The Greens argue that there are 2million Afghans, Eritreans and Syrians fleeing 'desperate situations' who need to be offered sanctuary in Europe. It has been calculated that because the 60million people living in Britain account for 12 per cent of Europe's population, the UK should take 12 per cent of the 2million refugees. Ms Bennett said: 'Stated as a single number, 240,000 sounds daunting, but put into scale, one refugee for each 266 Britons, an increase of 0.4 per cent in the population, then that's no impossibility. 'And we have to make it possible, for Britain has a humanitarian responsibility, as the world's sixth-richest economy, as a state whose unilateral, and sometimes illegal, actions have helped to create the political and military chaos in the region from which many of the refugees are fleeing, to not be the foot-dragger, the resistor, that it is now, but instead live up to our proud tradition of providing refuge over centuries. 240,000 I am bid, any advance on 240,000? 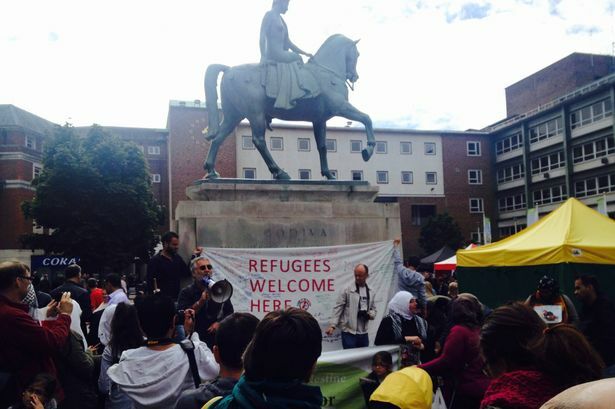 Coventry is ready to open its arms and welcome refugees from Syria as it is “the right thing to do”. The leader of the city council, Coun Ann Lucas, says that Coventry will never turn its back on those in need “wherever they come from” and will always be a “city of sanctuary”. Coventry has already taken in dozens of Syrian refugees who have escaped the conflict that has gripped their country, with more already lined up to arrive in the city over the next two months. And Coun Lucas says that Coventry is ready to step up to the plate once more. She said: “We are a city of sanctuary and a city that cares deeply about people in need, wherever they come from, and we have always welcomed new arrivals to Coventry. 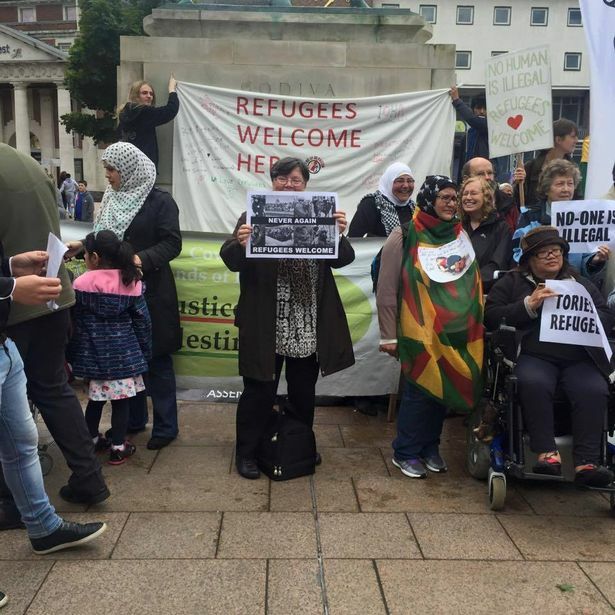 “Coventry has been at the forefront of welcoming those fleeing the conflict in Syria, and as one of four cities in the UK participating in the government’s response, Coventry has welcomed just over a third of those the government have granted asylum under the Vulnerable People’s Relocation (VPR) scheme. “We wanted to do what’s right. And this is the right thing. “As part of the UK government’s commitment to support the most vulnerable refugees from the Syrian conflict, as identified by the UNHCR (United Nations High Commission for Refugees), 78 people have so far been welcomed to live in the city, with a further 29 during the coming two months, and provided with care and support in Coventry over the past year or so. “This is part of the Government’s total of approximately 216 people as part of the VPR programme since it started. “The city council has taken responsibility for co-ordinating this within Coventry, making sure that people, most often women and children, who have suffered enormously through the Syrian conflict, are safe and cared for, in a dignified and appropriate way. “We are very fortunate to be working with voluntary sector and faith organisations across the city, as well as colleagues in other statutory services, who have ensured that every one of our new citizens gets the support and care that they need most, when they most need it. “We are pleased to welcome further people to Coventry and provide the same high level of welcome, care and support as those already settled in the city, and also to provide support and share learning with other cities and communities that offer places for refugees. At least we are seeing women and children in the report above. Most reports I have seen are mainly fit young men. But no matter how bad things are, we can't take them all in. Common sense has to prevail. - Something often lacking from the world of politics. She's round the bl**dy bend! Where are we going to put them you stupid woman? Protesters descended on Broadgate calling for refugees to be welcomed into the UK as they flee from the effects of war in Syria. The demonstration was organised by the Coventry Refugee and Migrant Centre in partnership with Coventry Stand Up to Racism and Coventry People’s Assembly. Sabir Zazai is the director of Coventry Refugee and Migrant Centre and came to Coventry as a refugee 15 years ago. Those who participated in Saturday’s protest also had the opportunity to write messages of support on a banner which will be displayed at Coventry Refugee and Migrant Centre. The organisation has uploaded a list of 15 ways to support refugees in the city at covrefugee.org. Look you stupid people, we are full! We can't cope with what we've got, never mind taking more. A refugee stops being a refugee once he moves from his first safe haven. - These are not refugees!